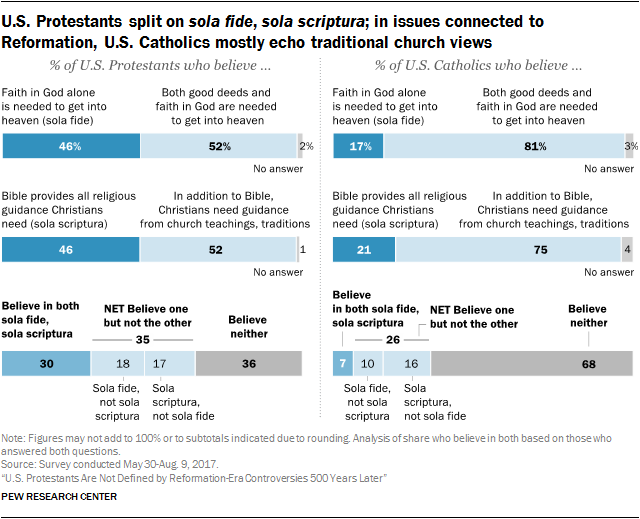 Before moving past this month's 500th anniversary of the start of the Protestant Reformation, let's think about what a recent Pew Forum survey says about Catholics and Protestants in the U.S. today. Here's a primary conclusion I draw: Many of us don't know lots about theology. We don't understand much of our own faith tradition's history and we're willing to adopt ideas in conflict with that history. In other words, many of us live theologically unexamined lives. We're theological and biblical illiterates. The Pew survey, for instance, reports that "many U.S. Protestants espouse traditionally Catholic beliefs on some issues. "For example, nearly half of U.S. Protestants today (46%) say faith alone is needed to attain salvation (a belief held by Protestant reformers in the 16th century, known in Latin as sola fide). But about half (52%) say both good deeds and faith are needed to get into heaven, a historically Catholic belief." That Pew wording "nearly half" seems misleading, making it sound as though 46 percent is a big number. It should say "barely half," to suggest that it's a surprisingly low number, which it is. After all, "faith alone," or sola fide, rooted in sola scriptura (scripture alone), the most important of the four other solas, became a primary distinction in the 1500s between Protestants and Catholics. Luther specifically rejected the idea that he needed the pope or other Catholic leaders to tell him what Scripture meant. Each individual, he said, could figure that out alone. It's been only in recent decades that Lutherans and Catholics (and, more recently, Reformed Protestants and Catholics) have agreed that salvation is solely dependent on God's grace, not a bit on our works or merit. I don't know if the 52 percent of Protestants who didn't understand that are among the 46 percent who seem not to understand the Protestant belief in sola scriptura. But many of them probably are. In other words, perhaps religious ignorance really is bliss. If you don't care about it, you won't fight over it. But how much better it would be if, instead of flabby agreement on — or disinterest in — previously divisive points of faith, we could understand in detail what we believe and why it differs from what others believe? That might bring us to the possibility of meaningful discoveries of surprising common ground or an agreement to live in peace despite our sometimes-profound differences. I'm reminded of what an Orthodox rabbi once told me about interfaith dialogue. A lot of it amounts to "interfaithless dialogue," he said, in which people with nominal commitments to a faith tradition and not much knowledge of other traditions come together and agree on generalities that they would have agreed on even if they'd never met. "It's insulting, actually," he said. True interfaith dialogue is hard, it takes lots of time and it presumes a reasonably deep knowledge of what you're talking about. But I suppose no one should be surprised to discover the ignorance the Pew study reveals when it tells us that about 30 percent of the Protestants didn't quite know what the Reformation was and couldn't name Martin Luther as its progenitor. I'm not asking that we return to the days when much daily conversation on the streets consisted of arguments about what happens in the Eucharist. But if we don't understand the essential tenets of our faith, how can we use them to motivate us to help heal a wounded world?